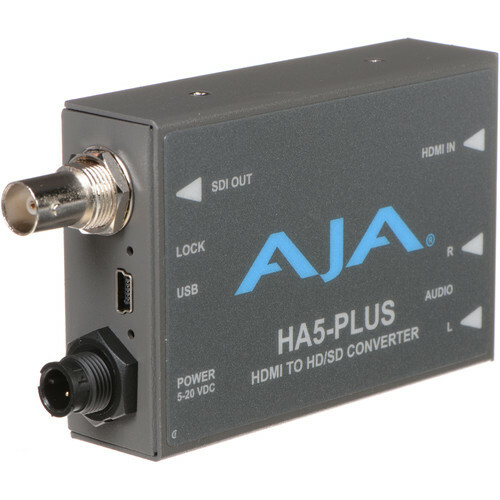 The AJA HA5-Plus HDMI to 3G-SDI Mini-Converter allows you to output an HDMI signal to an SDI monitor, recorder, or other device in up to 1080p/60 4:2:2 10-bit. Up to eight channels of HDMI embedded audio can be passed through to the SDI output, or you can connect independent RCA analog audio and embed it on the SDI output. When you connect RCA audio, you can decide whether to output the HDMI embedded audio or RCA audio or assign particular channels of each using AJA's free-download MiniConfig control software. MiniConfig also provides detailed information about the current input and output formats, allows you to control all the parameters of the HA5-Plus, and lets you download firmware updates. It's compatible with Mac and PC and interfaces with the converter via a USB connection between the converter and the computer. The HA5-Plus features a compact, portable, and rugged design and comes with a universal power supply with international plugs for use around the world. Note: HDCP content not supported on HDMI input. The HDMI input is equalized to support HDMI runs up to 98 ft using a 24 AWG cable. The 3G-SDI output features PLL clock filtering and ensures a low jitter output for solid image stability. An LED indicator shows the input source as either SD (green) or HD (red) for fast and easy signal identification. Using the RCA L/R analog audio input, embed any 2-channel analog audio signal into the SDI output to maintain proper audio sync throughout the workflow. The HA5-Plus accepts progressive standard definition signals at 525p and 625p for compatibility with DSLR cameras, allowing the signal from those cameras to be easily incorporated into SDI workflows. The HA5-Plus supports AJA's free-download MiniConfig software, which provides detailed information about the current input and output formats, allows you to control all the parameters of the HA5-Plus, and lets you download firmware updates. MiniConfig is compatible with Mac and PC and interfaces with the converter via a USB connection between the converter and the computer. HA5-Plus HDMI to 3G-SDI Mini-Converter is rated 5.0 out of 5 by 1.